Cats are rather delicate creatures and they are subject to a lot of ailments, but I never heard of one who suffered from insomnia. - Joseph Wood Crutch Mum left me alone most of the day yesterday. More of her playing in traffic. But when she got home and unpacked the cooler, she had a ham sandwich in it. So she had that for supper and shared me some of the ham. So then she cleaned up and then sat down on the couch and read the paper. So then I could snuggle with her. So I did get some time with her. But she was furry tired, so wented to bed early. YAAWWWNNNNN. Maybe I should join her. A proverb is a simple and concrete saying popularly known and repeated, which expresses a truth, based on common sense or the practical experience. A watched cat never naps. I am ready to nap, but since mum is around, those eyes of mine will not close until she leaves! Based upon the Peter Princple. You rise to the level of your incompetence. A cat rises to the top of the cat tree. Murphy's Law: Anything that can go wrong will. Any cat that can nap will. Mum enjoyed her day off, first that means the noisy thing by the bed does not go off, so that is nice. But she got up early enough to feed me before my bowl was totally empty. Then even though it was a vacation day she had to talk on the phone for a short while about her latest project. She has to keep these guys in line so they get stuff done on time. So much for taking the WHOLE day off, but she said she left early on Thursday to visit the tooth doctor for a checkup. So it sort of made up for it. I did not get to spend the day snuggling with her. After her phone call she left for a while and when she came back Grampie was with her. They messed about in the metal monsters room for a bit. Then left again. A bit later mum was back, finally for good for the rest of the day. I showed her, I didn't meet her at the door like I usually do when she comes home. I was not going to interrupt my nap. So not a bad day, but not really a full day with mum. Maybe soon we will have a day like that. I hope so, a day to sit and watch birdies, snuggle, mooch treats and get lots of scritches. Then today mum was gone almost all day playing in traffic again. When do I gets time with you? The enlightened male cat knows the best way to entice a female into his embrace is to sing. Songs yodeled under the full moon are especially favorable for romance. We are almost to a full moon, I better start warming up to sing a song for my sweet Princess Mia! I can practice by singing to my stuffed Tuxie. I have to think of some nice songs to sing to her. I can always sing her Tuxie Cat of Texas. My song I made up for her last year! Friday will be a nice day. Mum is taking a day of vacation and going to veg out for the day! Woohoo, so lots of mum time and snuggling on the couch. What to pick? We have so many flowers blooming right now. 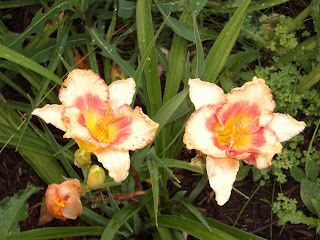 Why not some of the daylilies, mum has several different kinds. Mum does not remember the names of each of the types of the lillies, she would have to go and look that up and she doesn't want to do that right now. These plants put out lots of flowers and keep blooming for weeks. They are furry hardy and spread out to fill in the garden. So lots of color and greenery. We had a wonderful turn out for our monthly prayer circle/vigil. It was fun and easy to host. So if you can spare an evening sometime, consider volunteering. Lots of kitties showed up and we purred hard for all of our furiends four and two footed who need some extra help if they are sick, ailing, needing some extra care or to find a new home. Always thinking of our beans who are sick, or safely home from places of danger. OK, time to go and snuggle with mum. Happy weekend! I hope that all of you can join me on Thursday evening for the monthly Cat Blogoshpere purrayer vigil. I am hosting this month. I am getting my purrayer pose all ready for tomorrow. Hope to see you there. Lux asked us to show our favorite expression. Mine is one of 'I want to be alone'. I know you are there with the flashy box thing, but I am trying to nap. Leave me alone. When I want your attention I will look you up. I was not scolded just before this picture, just disturbed from my nap. We had Mr Hawk visit Sunday afternoon. Mum was sitting outside reading (not Harry Potter) and I was sitting just inside the windows that go all the way to the floor. Suddenly every birdie scattered. Even a squirrel in the neighbor's tree flattened itself against the tree. Into that very tree landed the hawk. He sat there for a few seconds, then flew over to sit in OUR crabby apple tree! Mum and I were about 20 feet from it. It looked at mum for a few minutes and then flew off to the west. I think he figured mum as a little bigger than he could take on and I was safe inside the house. Mum was mad that she didn't have her camera outside. On Saturday she did have it out there and took lots of pictures of birdies. But today she wanted to finish her book, so she didn't want to be stopping to take pictures. Now she is mad that she didn't have it with her. I have been sitting at the open windows lately and calling out in a loud Merrowwwr. I have sensed a new kittie around and last night he finally showed his or her face. It is a little black kittie. Mum saw him too but when she looked out the window it ranned away. So the kittie must be scared of beans. Mum will see if we can track it down. It isn't a kittie we have seen before. We don't even have that many kitties in the neighborhood anymore. The people behind us who used to leave their kitties wander around are gone. The same people are there but now no kitties, just a new baby. The kitties went away when the new baby came. I hope they found a nice new home. Mum did cheat on the Harry Potter thing. She was in store that had the books out for sale. So she opened it and took a quick look at the end. So she knows who survived etc, that is what she basically wanted to know. The details of how it got to the end, she will deal with later. Mum will use the local library for the book and not buy it. There are over 50 people waiting to read the book, but they do have 8 copies of the book to loan out. Mum figures that when the waiting list gets shorter AND she knows she will have the time to read it she will sign up. They only let you have the book for a week, and sometimes mum is busy where she wouldn't have time to get a book readed within one week. If your beans have been sitting and reading all weekend, tell them it is time to get up and do a good stretch. It is not good to just sit in the same position for hours and hours. Everyone, S T R E T C H. Very good. Repeat S T R E T C H. That is all, you can return to your regular duties. It has been a wonderful weekend so far. Weather is nice, sunny but not hot. The neighborhood has been quiet too. Seems like lots of people aren't even home, which makes for a peaceful time. Victor pick up on my Fat Paw Syndrome yesterday. I typed in Tabbly and not Tabby. Guess I invented a new type of kittie color. I know that Catfuious didn't talk about when to romance for every fur color or type of kittie. Guess you are on your own when to pick the right time for romance is. Many of you commented about the flowers on the the post on Flower Friday. No mum does not bring them in for me to play with. I don't think they turn into sparkle balls, unless the toy fairy comes by and take them away to make them sparkle balls. Victor also commented that his mum thought the flower was an allium. Mum says alliums bloom in the spring when the tulips and such are blooming. Here is a couple of pictures of them from this year. We even got one that turned white and not purple. This is how the alliums look now, the flowers have dried and you can see the seeds of the plant. Mum leaves them in the garden so the birdies can eat the seeds. Mum found one the the thistle flowers all opened up. She had to pull it down so she could get a good picture of the flower. Even the bumbled bees like the flowers and so do the humming birds. But mum has never been able to get a picture of a hummer in our yard. At least not yet! Hmmm, a big noisy metal monster has pulled up on the other side of the street. Mum calls it a bus. Seems it is picking up all sorts of people from the house across the street. Mum says they must be taking the bus to a party, then they are not drinking and driving. Too bad they can't just teleport there like we kitties do to a party. I will nap some more, them work on mum to get some more treats. To ensure strong offspring, romance should occur according to fur color. White cats should romance in the winter, orange cats in the autumn; black cats in the spring; tabbly cats in the summer. Calico cas may romance whenever they wish. Woohoo, that means romance time is coming soon for me. Guess I better schedule some time to romance my Princess MiaBella. Doesn't say what time of year is a good romance time for tuxie's. Lord Jader asked about Derby's Dreamcats. It is mostly a site for those of us to show off our sweeties. Some kitties have joined along with their sweeties. So if you want to join you can. Go check it out! Mum has been very busy with working. No fun for her, but that means not as much fun for me either. She doesn't want to come home and look at another 'puter, which means she doens't turn the home one on much. So I try to keep up with everything, but may not be saying much. I am happy it is open window time again. The weather is nice and cool enough again so mum can come home and open windows. I sure do like that. I spent the evening running from window to window to window to check things out. Saying hi to the buns, squirrels and birdies. Hi mum, you want to share looking out the window with me? OK, I think we can do that. I know we are both happy we can have the windows open again. Let's just alax and what our little outside furiends. Plus this weekend you have to help me find a nice picture for Jeter's Squillion contest! This is a furry large plant by the back fence. Mum says it was here when she bought the house. Plus there is another plant like this behind the house by the patio. Here is a closeup of the flower. It is like a little purple ball. Mum says the plant is an ornamental thistle, not to be confused with the thistle plant that most people treat as a weed (even though mum says that plant has a neat looking flower. Even Uncle Flip was impressed with this plant when he was here a couple of years ago. Mum had to dig some of the plant up and send it to him. His is growing very well in his garden in Merryland. Hope everyone has a wonderful weekend. Mum says we need to rest, well, she needs to rest. Purrs. The group at The Zoo Crew nominated me for The Schmooze Award. I am a natural schmoozer, sort of runs in the family. Grampie, mum, Uncle Stormie. I think we can all just sit down with anyone and visit. Plus since I am running for office with Cheysuli, I need to be good at schmoozing. "As it goes, schmoozing is the natural ability 'to converse casually, especially in order to gain an advantage or make a social connection.' Good schmoozers effortlessly weave their way in and out of the blogosphere, leaving friendly trails and smiles, happily making new friends along the way. They don’t limit their visits to only the rich and successful, but spend some time to say hello to new blogs as well. They are the ones who engage others in meaningful conversations, refusing to let it end at a mere hello - all the while fostering a sense of closeness and friendship." Plus the LOLCats at I Can Has Cheeseburger made Time Magazine this week! We internet cats are becoming more mainstream! I keep thinking I has something else to tell you guys, but it hasn't come to me. If and when I amember it I will post on it. Schmooze to you all. I think this is very true. I don't have to work to get my food, unlike mum who goes out and picks berries and earns green papers to pay for food. I get to run around the entire house, you can see me sleeping on mum's bed the other day. Love, well, it just flows and if for some reason I do something I shouldn't, like yak up on the floor, mum still loves me. Not a bad thing. Once mum was done with the berry picking and all we had a quiet day on Sunday. Mum sat and readed her book, we watched the birdies outside. At one point they all scattered very quickly. We saw Mr. Hawk flying and chasing a dove. I was glad that the Piney Wood girls were not here today. It might have been scary to them if they haven't seen a hawk before. Mum says that if she is around it is not likely that the hawk would attack anything near us. Plus we had a baby bun in the yard and all of a sudden it did a binky! Wow, that little bun got two feet off the ground. I have seen Fi and Lando do them, but I was expecting them. To see a bun just do it for fun was wild. Mum says she is enjoying the berries she picked. The raspberry is her favorite summer berry! Seems like such a quiet day today. No guests and all. Patches, Mittens, Mistrie and Precious all came over to alax in the cool weather here yesterday. We didn't do much but sit around and be lazy. But the girls all appreciated the cool weather, I even think I saw a fairy who came along and hid under the flowers in the garden. Precious and I compared notes about being sassy. She has such a natural talent that I don't think I can even teach her anything. You either are sassy or not. Precious is definately sassy. I hope CalicoMom Toni won't be mad at me, but I really haven't taught her anything she didn't already know. The girls stayed to the end of the day and teleported home as the sun was setting. Hopefully when they got home it was a little cooler for them. Good bye ladies, stop by again sometime when it it hot a your house and cool at mine. Mum says she won't mind. She enjoyed having all of your here as well. Mum got up early today and went and picked more berries. Said this will be the last time this year as the berries are just about all gone. Mum took one of the little boxes over to Grampie and she is saving some for the buns to come over. So Lando, Fi, Mrs. Sniffles and anyother bun can come over for a little treat. We are having another wonderful day here, sunny, not hot. Mum says it may be time for us to go sit outside on the patio. That means I can hang out in my porch with her. Anybody else that is too hot can come over. I am just taking it easy today, hanging out and napping. I have to be sort of ready in case the Girls of the Big Piney Woods teleport over. It is so furry hot where they are and I invited them to come over to enjoy the wonderfully cool Whiskerconsin weather. If the faires want to come along they can. They won't be sweating here. These are pictures of our garden today. A hazy sunshine, not hot, and the sun will be going where there will be more shade here soon. We even had a nice rain shower early today, so everything has been washed clean. Mistrie can chill out in the garden, the rest of us can sit by the big windows that go to the floor. We can all visit together. Mum is sort of taking it easy. The washy machine has been busy and mum has been picking up the newsy papers. But mostly she is reading a book today. But when she was making up the bed, I was trying to rest and she got me as a bed lump again. First I had to help her get the bottom sheet all pulled out nicely and tight. I will get this side mum, you pull on the other end. Yes, that looks nice. I can just nap now. What another layer? OK. Let's get the next sheet put on too, I will help with this side, you work over there. Yes, mum I am here, trying to help you. What do you mean my side is all messy and lumpy yet. I haven't quite finished. See, I can do this, now my side looks nice too. Now can I nap? No?! Sheesh, now for the blankie. Why do you need so much stuff on your bed? Mum, I am tired of this. I just want to nap and you keep making me a bed lump. That is it. I have had enough. Finish this on your own. I think I hear the girls arriving in the other room. See ya. An unflattering collar creates bad romance. The wise cat knows that all collars are unflattering Remove the collar at once and hide it where humans cannot find it. I have tried this multiple times. Once I managed to hide it good enough that mum didn't find it for a week. But mum does buy the safety collars so that it will come off if it gets caught on something. This is where she found it when I hid it under the blankets on the bed. Go back to December 2005 for the whole story. But mum does take it off sometimes and let me go naked. Plus then she can get out the zoom groom and brush my furs real good. This week I am not forgetting to post my flower on Friday. Mum was outside tonight a took a whole bunch of pictures of the new flowers that bloomed this past week. This is the same plant, top picture is when the flowers were just beginning to open and then when they were open. Mum says this is is a "Asclepias tuberosa" and is good for attracting butterflys. Mum has lots planted that will attract butterflys and hummingbirds. Plus we had good rains this week so everything looks perked up. Mum says she is happy it is Friday and that we can have a quiet weekend. Here are my nominee's for Rockin' Boy Blogger. Hmmm, shouldn't this be Rocking' ManCat Blogger? Victor TabbyCat - my fellow Wiskerconsin blogging buddy. Connor Cloud - An Iowa cat from my mum's hometown who looks like my twin too! George & Max of The Crew - my nearby Whiskerconsin neighbor cats (next suburb south) who blog. Max and I were at the same shelter, but not at the same time. Concatulations to all of you! Plus when mum brought in the stuff from the black box on the front of the house, she brought in a little box for me. Yay, my Secret Paw stuff arrived from Dobby. Me checking out the package, mum I don't think I can chew through the box, please get your cutting things out and open it. It might be a little box but it was holding some real big prizes fir me. Two types of treats and two types of toys. 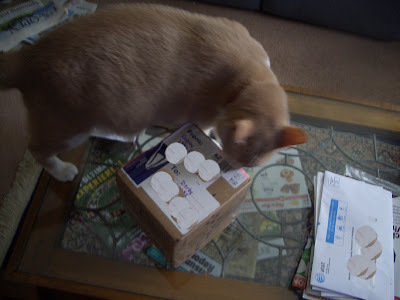 The box itself isn't bad either, just the right size for me to rub my chin on, plus a little tape to chew on too. Mum pulled out one of the Bobble toys, that roll around. Mum put it on the little table but I knocked it down on the floor an attacked it!